The reservoirs aquainlet PRO and aquainlet XT are designed to be directly mounted onto an aquastream XT or Eheim 1046 pump. The design is perfectly matched to the pump, after installation pump and reservoir form a virtually seamless unit. In particular, the mounting rails of the pump are extended into the reservoir, which for the first time allows for the mounting plate to be installed beneath the center of gravity. This is especially helpful when using rubber decouplers or a shoggy sandwich. When installed onto the suction port of the pump, an o-ring seals the connection between pump and reservoir and two latches secure the reservoir to the pump housing, preventing accidental release of the bayonet coupling between pump cover and pump housing. Two connection threads for the return line located at the front and the side of the unit allow for flexible installation options and are paticularly useful if the reservoir is to be installed with limited space. The reservoirs aquainlet PRO and aquainlet XT are closely related to the aqualis series and are also equipped with a borosilicate glass tube. In contrast to acrylic glass, which is often used for tube reservoirs, borosilicate glass is extremele hard and scratch-resistant, features superb thermal and chemical resistance and a very low thermal expansion. The glass tube has an outer diameter of 50 mm and a wall thickness of 5 mm. Base and top of the aquainlet reservoirs are made from Delrin and connected by a stainless steel rod. The aquainlet XT variants feature an acrylic window in the base part and one LED (5 mm size) can be installed into the base part. Additionally, the XT variants feature an electronic fill level sensor with USB and aquabus interface, a programmable alarm output and an external temperature sensor input. For monitoring and configuration, the aquasuite software can be downloaded free of charge. 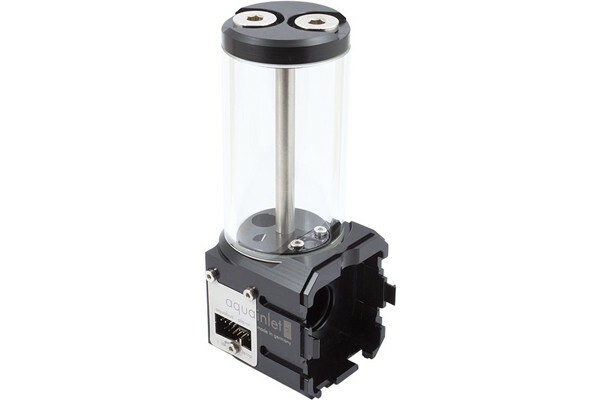 In addition to the USB interface, the 4-pin aquabus interface can be used to directly connect the fill level sensor to an aquaero 5 controller (not included in delivery). The alarm output can be configured to be used as a rpm signal to be connected to a fan connector with fault detection (for example motherboard fan headers) or to be used as a switched output for example to connect a LED. Fill level and external temperature sensor input can be configured to raise an alarm. The external temperature sensor input is compatible with all Aqua Computer temperature sensors. All variants are also available with a nano coating that will cause water to roll off the inner surface of the borosilicate glass tube. Please note: Fittings and pump are not included in delivery, please order seperately.